← Recipes without Quantities – Tuscan fun! Music – “Let the Sun Shine In” from Kings & Queens of the Forest by Kira Willey. Released: 2011. While looking through some of my antique cookbooks, I came across one, which I had not previously spent much time looking at, as it is in extremely fragile condition, has lost it’s original covers, was bound in cardboard by someone and is generally falling apart. The index is missing, but most of the contents are in place, except for a few pages at the beginning. The book, ‘The Everyday Cook-Book’, was written somewhere around 1888 and with possible revisions or editions through 1892, by ‘Miss E. Neill’. Searching for versions of the books, I came across a possible alternate title of “The Everyday Cook-Book and Family Compendium”, which would make sense, given the fact that it is partly cookbook, partly life and health advice and runs the gamut from “Lady Fingers” to naked ladies! 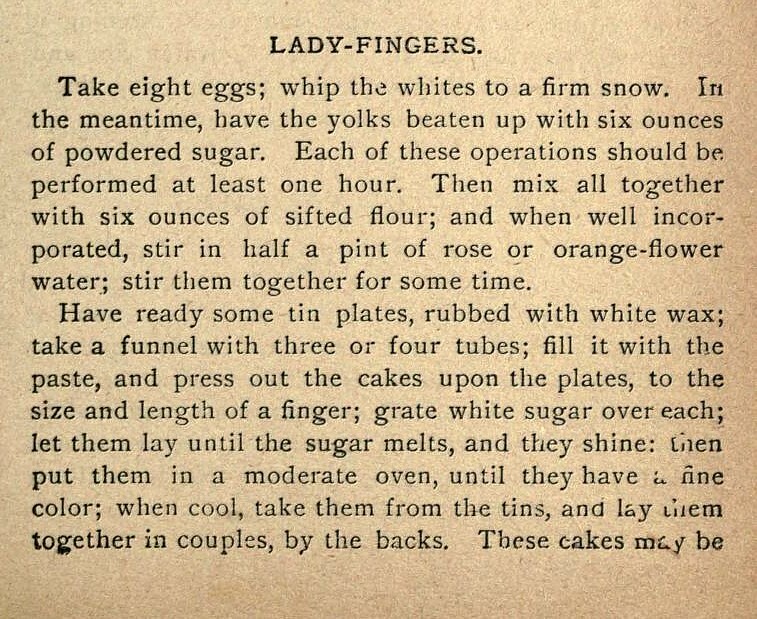 Now, below is the recipe for “Lady Fingers”. Better have strong arms, a lot of time and even more patience. Beating the egg whites and then the egg yolks will take an hour for each step! After spending several labour intensive hours beating eggs and making Lady Fingers, the sophisticated lady may then transform and rejuvenate herself by getting naked and dancing in the sun. Oddly enough, I always associate the word ‘denude’ with the use of Agent Orange in the forests of Vietnam during the Vietnam War, and not divesting oneself of one’s clothing but I’m dating myself here. Alternately, if dancing is not your thing, you can opt out and brush your hair with sulphur water or similar! What a way to spend an afternoon! Truly, antique cookbooks often give us more than ‘receipts’ to fill the stomach. They often provided ‘receipts’ for life, health and even happiness! This entry was posted in Cookbooks, Cooking, Cooking and Social History, Eating, Recipes, Uncategorized, Vintage Cookbooks and tagged cookbooks, Cooking, food history, Miss E. Neill, social history, The Everyday Cook-Book, time capsules. Bookmark the permalink.